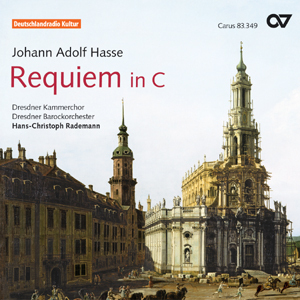 As a composer Johann Adolf Hasse (1699–1783) was the uncontested idol of the late baroque era. Although today he is known primarily as an opera composer, he left behind numerous excellent sacred works. At last, the sacred music he composed for the court of Dresden is being made accessible in recorded form. 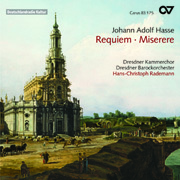 As in the case of the CD containing Hasse’s Requiem in E flat major and Miserere in D minor (Carus 83.175), winner of several prestigious awards, once again the Dresdener Kammerchor and the Dresdner Barockorchester, under the direction of Hans-Christoph Rademann have devoted the present CD to a recording of Hasse’s Requiem in C major and the Miserere in C minor: this might also be a candidate for a some awards.